Where I Got It: It’s an arc from netgalley.com, which hasn’t influenced my review in any way. Promise! Goodreads Summary: In the world of Sorrow’s Knot, the dead do not rest easy. Every patch of shadow might be home to something hungry and nearly invisible, something deadly. The dead can only be repelled or destroyed with magically knotted cords and yarns. The women who tie these knots are called binders. Sorrow’s Knot is definitely interesting, and I absolutely loved the mythology and stories in this world. There’s a very Native American feel to the book, and I was pleasantly surprised by that because I typically associate fantasy with a medieval feel. I’m actually really curious about what myths Bow looked at (if any) and what her inspiration for the book is, because the whole premise is really imaginative and detailed. I really liked the ghosts that Bow came up with and the story behind them. It’s definitely creepy and haunting, and their story is definitely different than anything else I’ve seen. The stories that Cricket shares, and the seemingly small world they live in, is definitely different. This society is all female (except for Cricket), and they, for the most part, live in a part of the forest. The world definitely opens up to Otter at one point in the novel, and it was interesting to see how the world changed for her. It took some time getting into Sorrow’s Knot, and it wasn’t until halfway through that I got really interested in what was going on. Things do move at gradual pace for quite a good chunk of the book, and while it’s worth it in the end, I also wish that I found the first half more interesting. I really am struck by how much I loved the world building. I didn’t really pay a lot of attention to the characters. They were okay, but Bow created such an intriguing world, that I really couldn’t think about anything else. 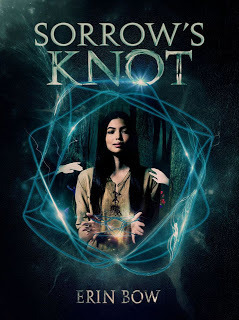 It really is the star of Sorrow’s Knot, and I really can’t help but gush over how much I love the idea of magic in the form of knots and cords. I did feel like the characters were a bit overshadowed by all of the world-building. I will say that Cricket actually added a really nice balance in such a female-dominated world. As much as I loved the world of Sorrow’s Knot, and all of the stories that this society had, it also took me a little too long to get really interested in what was going on. Sorrow’s Knot gets 3 stars.